With its sliding partitions and flexible seating, walking into The Studio is a new experience with each visit. 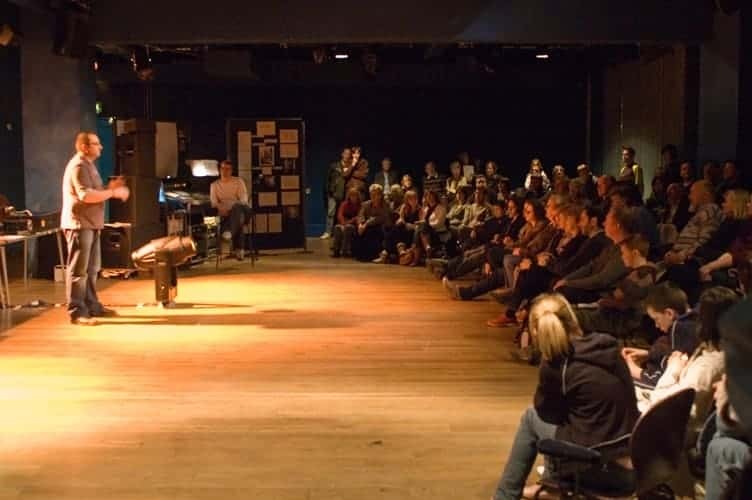 An intimate 90-seat space, The Studio welcomes nationally renowned touring companies alongside Royal Exchange productions, showcasing an ecletic programme that includes performances by local communities and our Young Company. Every season our Studio sets the stage for World Premieres and award-winning new writing by some of the most exciting talent in the UK. It is a space for innovation, where we support and collaborate with the next generation of theatre makers. Dedicated to the development of new ideas, we both commission and produce new work that will often go on to have a life beyond our building, touring nationally to other theatres, community venues or festivals. The Studio is fully accessible, with ticket prices starting at £10 and discounts available. Seating is unreserved. The Studio has its own bar, and drinks can be taken into the show. We want to make your visit to the Royal Exchange as enjoyable as possible and we aim to cater for everyone’s needs. Our home is the Royal Exchange building on St Ann’s Square in the heart of Manchester city centre, just a short walk from Market Street and the Town Hall on Albert Square.